The Common Kestrel (latin: Falco tinnunculus) has also been known in England as the Wind-hover and Stannel Hawk. Its name is often simply shortened to Kestrel. Unlike the sparrow-hawk, the Kestrel is undoubtedly gregarious, and will build its nest in close proximity to the habitations of other birds, a number of nests being often found within a few yards of each other. The scholar HB Tristram remarks that he has found its nest in the recesses of the caverns occupied by the griffon vultures, and that the Kestrel also builds close to the eagles, and is the only bird which is permitted to do so. It also builds in company with the Jackdaw. The Kestrel has a very large geographical range, being plentiful not only in England and Palestine, but in Northern and Southern Europe, throughout the greater part of Asia, in Siberia, and in portions of Africa. The bird, therefore, is capable of enduring both heat and cold, and, as is often the case with those creatures that are useful to man, is a perfect cosmopolitan. The illustration is drawn from a sketch taken from life. The bird hovered so near a house, and remained so long in one place, that the artist fixed a telescope and secured an exact sketch of the bird in the peculiar attitude which it is so fond of assuming. After a while, the Kestrel ascended to a higher elevation, and then resumed its hovering, in the attitude which is shown in the upper figure. 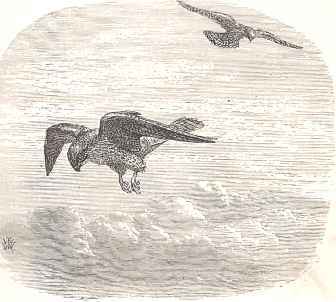 It is easily trained, and, although in the old hawking days it was considered a bird which a noble could not carry, it can be trained to chase the smaller birds as successfully as the falcons can be taught to pursue the heron. The name Tinnunculus is supposed by some to have been given to the bird in allusion to its peculiar cry, which is clear, shrill, and consists of a single note several times repeated.